HQMS Risk Management helps you document, analyze and track mitigation of risks in your organization, such as manufacturing non-conformances, customer and supplier issues, or occupational hazards. 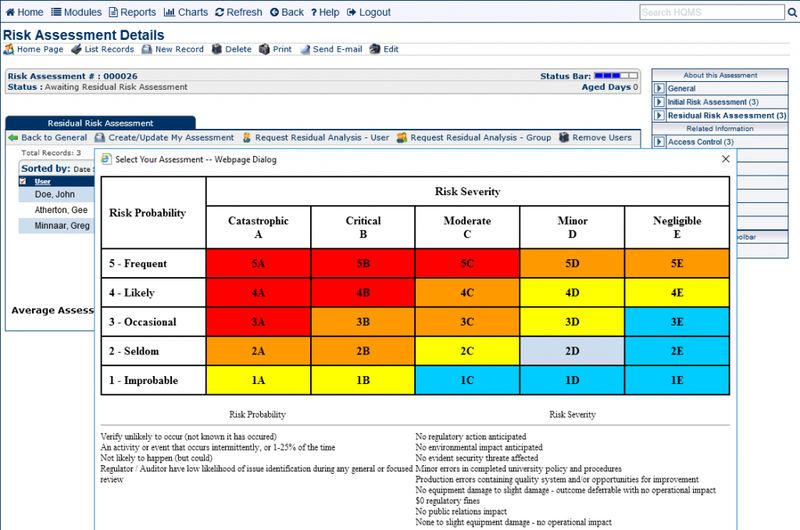 In the risk assessment record, you describe a potential risk, assign responsibility for its analysis, rate the likelihood and severity of the risk, and detail controls implemented to mitigate the risk. HQMS Risk assessments have a stage representing each of these activities. Each stage must be completed in order. However, any stage can be closed immediately if the stage is not necessary for the assessment record. Once these stages are complete, the record is closed and cannot be edited. 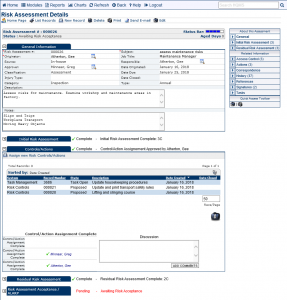 1 Employee Creates the Risk Assessment record, explaining the potential risk and its impacts. 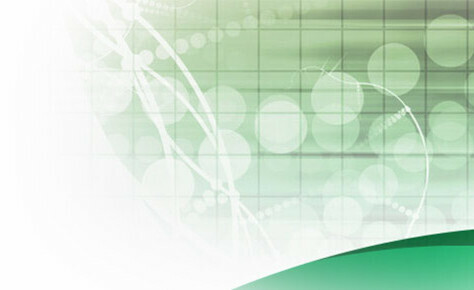 2 Employee Performs initial risk assessment to determine the severity and probability of the risk. 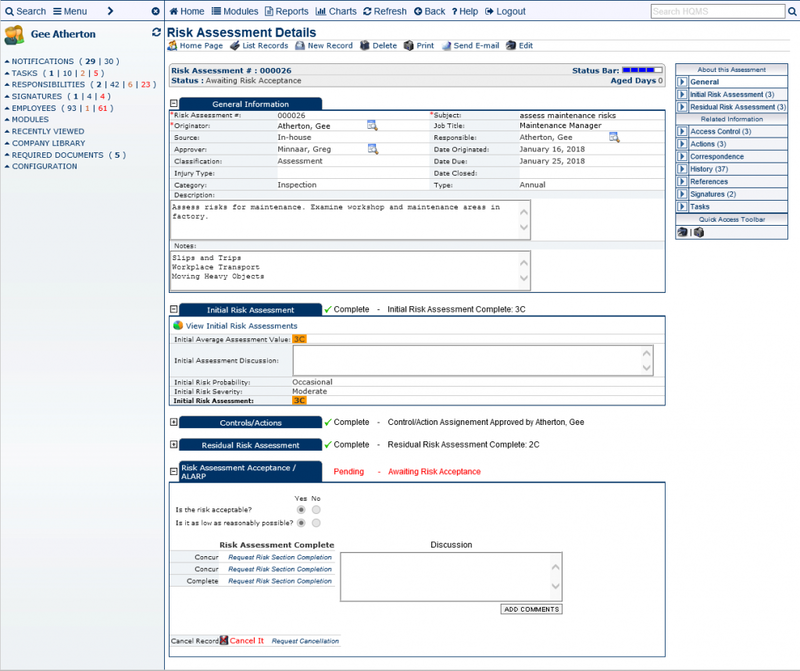 3 Employee Creates and performs Risk Control actions to mitigate the risk. 4 Employee Performs residual risk assessment to determine the severity and probability of the risk, post mitigation. 5 Employee Accepts the risk and closes the record. 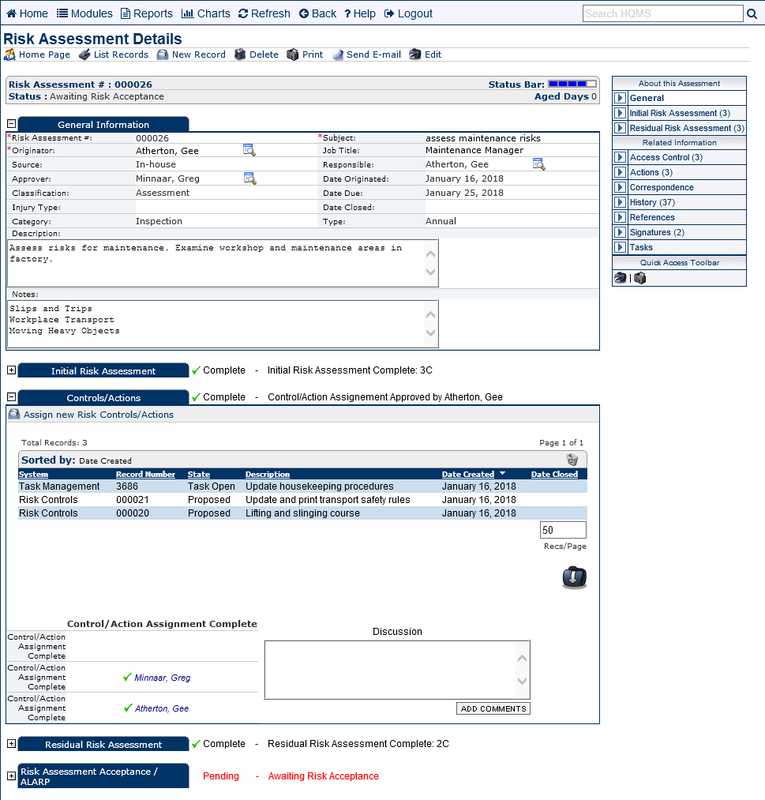 The initial HQMS Risk Assessment entry contains the Risk Assessment Number, Subject, Originator, Job Title, Source, Responsible Person(s), Date Originated, Classification, Due Date, Injury Type, Category, Type of Risk Control, Summary Description and Notes.